At its F8 developer conference, Facebook revealed that it would be rolling out a slew of new features for its Live Video service to help the site steal users away from the current king of streaming apps, Periscope. Yesterday, one of those updates arrived on the desktop: an interactive map that shows streamers from across the world. To access the new map, select the ‘Live Video’ link under Apps in the left sidebar on your Facebook timeline. Once you’re connected, you’ll see a list of the most popular streams down the left side of the page; but some of the most enjoyable moments come from checking out random users across the world. With the feature still being in its infancy, the feeds do vary in quality and most of them seem to have under 100 viewers. But many are hilarious – intentionally or otherwise – and you’ll probably find it hard to drag yourself away. I spent several minutes fascinated by a Columbian man having a deep, albeit one-way, conversation with his cat. The map works in a similar way to the one found in Periscope. Dots indicate the areas where streams are taking place, hovering over one will bring up a preview, and clicking on it will expand so you can post comments. Additionally, hovering the mouse over a blue dot that has an expanding transparent ring around it will bring up threads which show where in the world people are watching the streams. 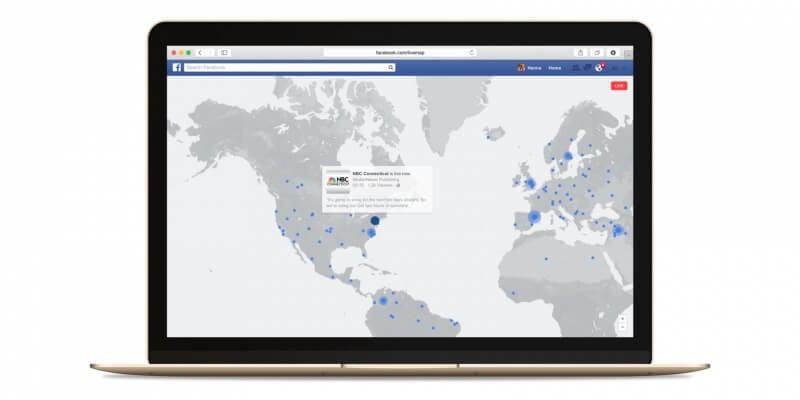 At the moment the map is only available on the desktop, but it’s likely that Facebook will want to continue competing with Periscope by bringing the feature to the mobile app at a later date.